When it comes to third party corruption, many compliance program leaders worry that they don’t know where to start on a third party compliance program and that they cannot afford the elaborate, richly funded programs that are so often profiled in the news. 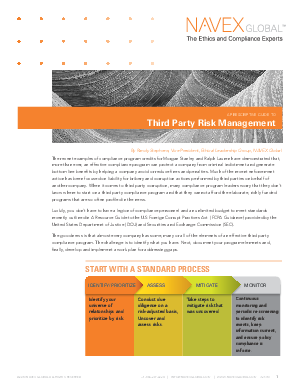 The good news is that almost every company has some, many or all of the elements of an effective third party compliance program. The challenge is to identify what you have.